← Random Period of Excellance Between Two Quotation Marks. On Campus/ Off Campus Design Elements Walk. Maryville College seems to wish to invoke a “historical” feel to those who visit it. 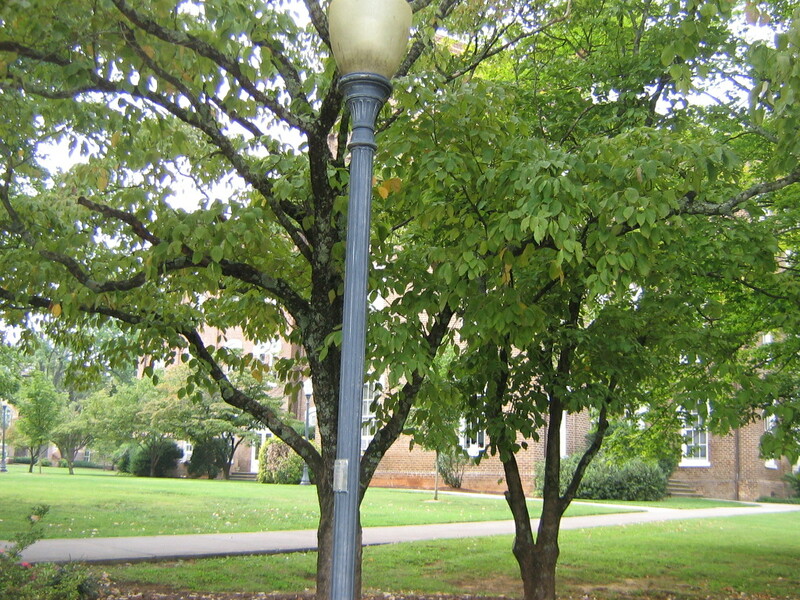 I’ve been told that the streetlights are a relatively new addition to MC’s campus, and they do capture the “historical” feel despite being a newer addition to the school. The lights add to the historical design of the college and add to the ambiance radiated by the college. Anderson Hall and the Bell Tower. 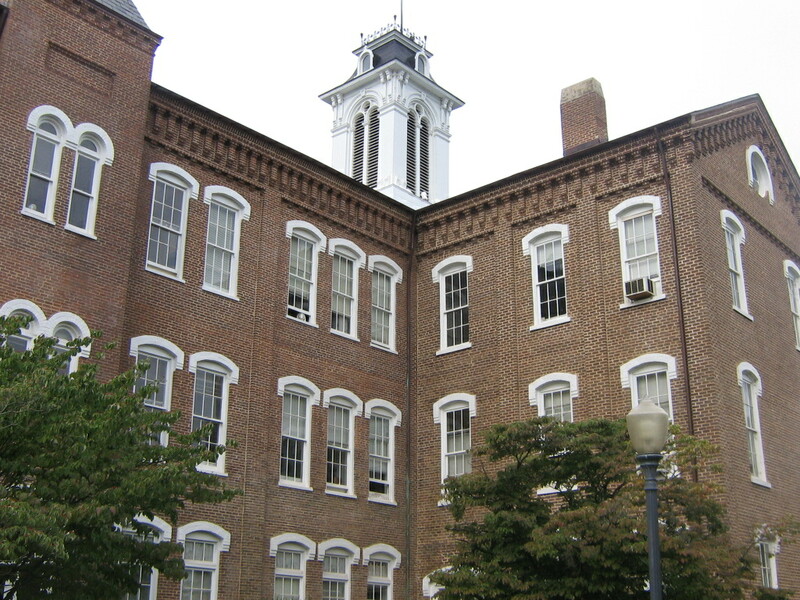 One of the first things seen as you enter the college (or view from outside the college bounds) is Anderson Hall’s Bell Tower. In ads and recent logos the Bell Tower is highlighted as a main aspect of the school. 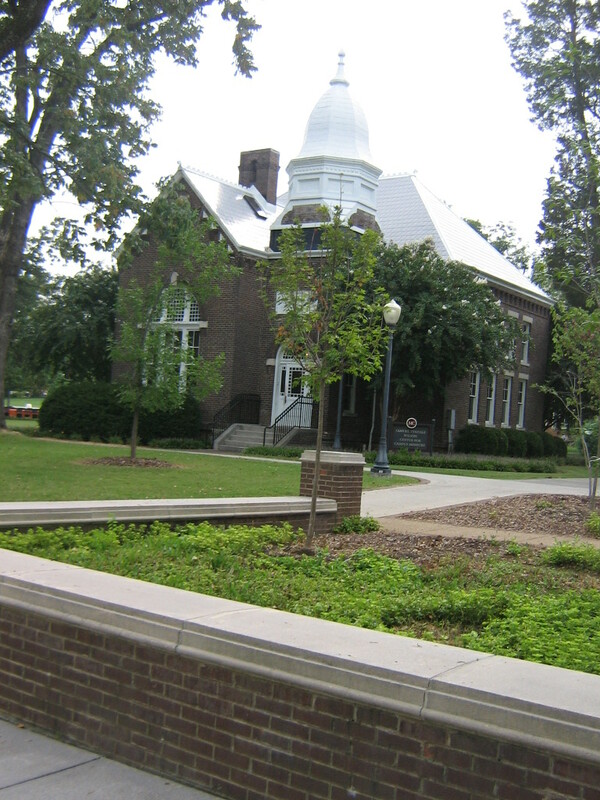 Anderson Hall is one of the older buildings on campus, and adds to the historical college feel. Scholarship, Respect, and Integrity Rock. 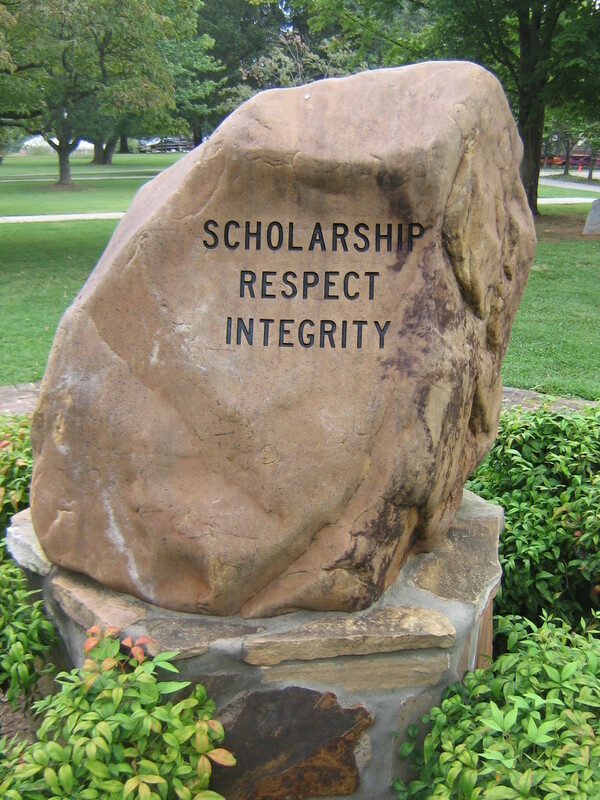 The Rock’s wording is supposed to evoke student’s with MC’s main ideals that they wish student’s to respect and gain during their time at Maryville College. It is an highly respected piece of artwork and seems to influence the actions of students in stating the basic three traits Maryville College students will gain during their time there. Maryville College began with heavy Presbyterian ties. 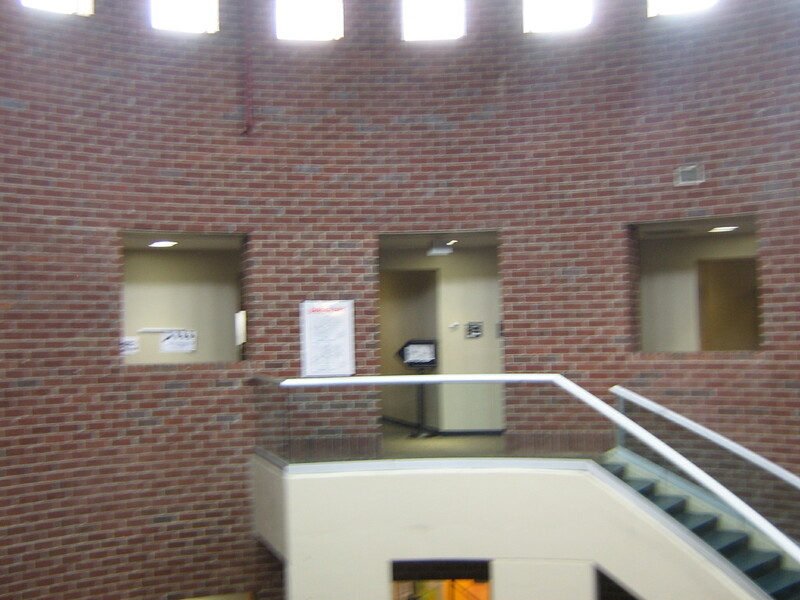 As such, the Campus Ministries building is the “center” or “heart” of the college in terms of it’s’ placement. 1. Is our campus an example of effective gestalt? In a way: Yes. In a way: no. The majority of the buildings do have ties to each other in terms of location/age. Yet; the newer buildings have all been erected around them. Clayton Center seems to subtract the most from the campus’s unity because it doesn’t capture the historical feel as much as say Anderson Hall and Pearsons. 2. What creates the most emphasis when entering as a guest? Three things: the Bell Tower, the historical feel, and the Clayton Center. The Bell Tower is highly intentional in terms of capturing emphasis. It is the highest point in the college and can be seen from afar even outside college grounds. The historical feel adds to the ambiance of the college thus capturing guest’s feel that MC is a historical place. Clayton Center is one of the newer buildings and most extravagant. It is located RIGHT at the main entrance of the college. More or less yes. However: It seems to be taken away by the newer additions to campus (IE: Clayton). The older buildings seem tied together historically, and the newer ones just seem like weird additions to the MC building family. 4. Natural Environment visual hierarchy? Around campus; I would say no. The environment is constantly changing due to weather, seasons, and natural causes. Yes: the environment draws attention, but it is constantly at change, so who knows where or what it will be like years from now. 5. What seems to be in close proximity? The older buildings. Anderson seems to be the main draw (despite how the Campus Ministry is at the center of the Campus) of people’s attention thus making it seem like all the buildings are connected around it. 6. How does scale, line, shape, etc. add or subtract unity in a space? These things all draw visual attention. If one aspect is greater than the other, or left out, then it may mess up the “feng shui”of things and make it less appealing to people and the things (buildings/environment/whatever) around it. 7. On campus: How these hierarchies affect interactions and behaviors on campus, as well as people’s perceptions. Student’s seem to respect their campus because of the historical feel. They feel privileged to walk the halls of MC’s historical timeline. Perception wise: people outside the college, whom take the time to visit the college, seem to grasp some sense of prestige granted from the college making their perception focused on how great the college is. For this walk around: I’m going to have to do things a little differently. With Pellissippi State, there really isn’t some kind of “unity” within the campus. The buildings have all gone up whenever the school needed to expand and satellite campuses have also gone up with no “real” connection to each other except being part of Pellissippi State. So, for this assignment, I took photos of things I found design in and will respond with what I got from it via the vibes they gave off. Anyway: I find some weird design in the layout of the Goins building’s upper floor. Basically: It is designed in a big brick circle with little cutouts for “windows.” In a way it feels like you are standing in a big brick farm silo. Why they chose the design is anyone’s guess…but I like it. 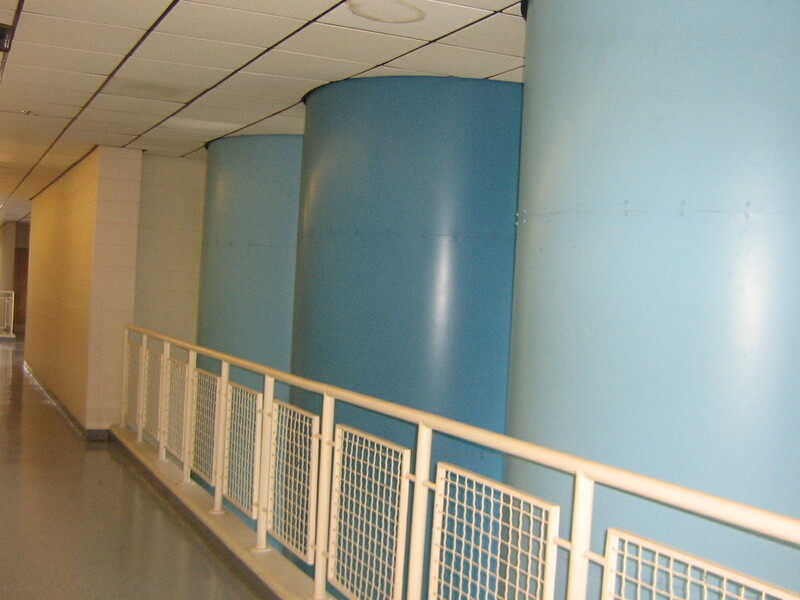 One weird thing about the Hardin Valley campus is the fact that there are little random design oddities that don’t make any flippin’ sense in terms of why they are there. What is this? What is it’s purpose? 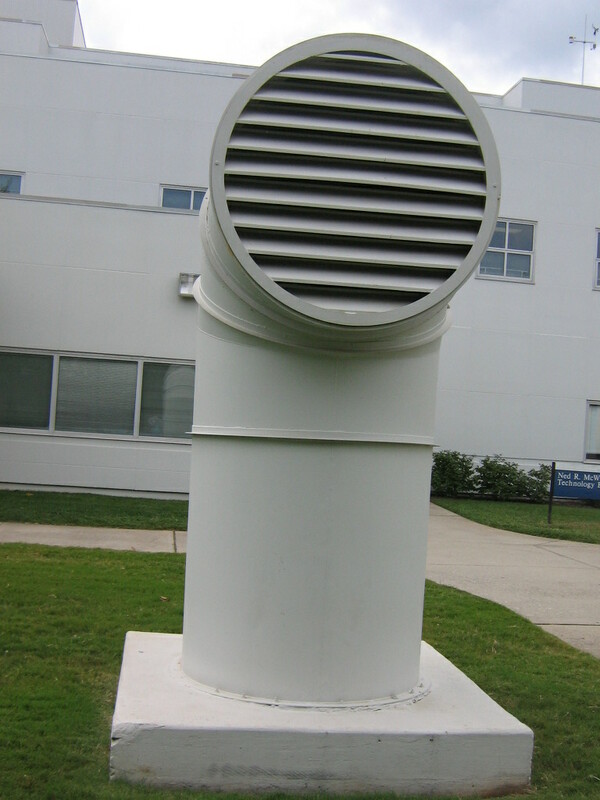 It looks like a ship’s vent port…and last time I checked, Pellissippi State is not Titanic or an Atlantis Cruise ship. So why is this there? I don’t even know what the purpose of these three things are. Nobody does! In my 2 years at Pellissippi these have been a strange oddity that made me wonder: Did “Sally’s Ship Supply Have a Super Sell” that Pellissippi splurged loads of money on in effort to enhance their campus feel? 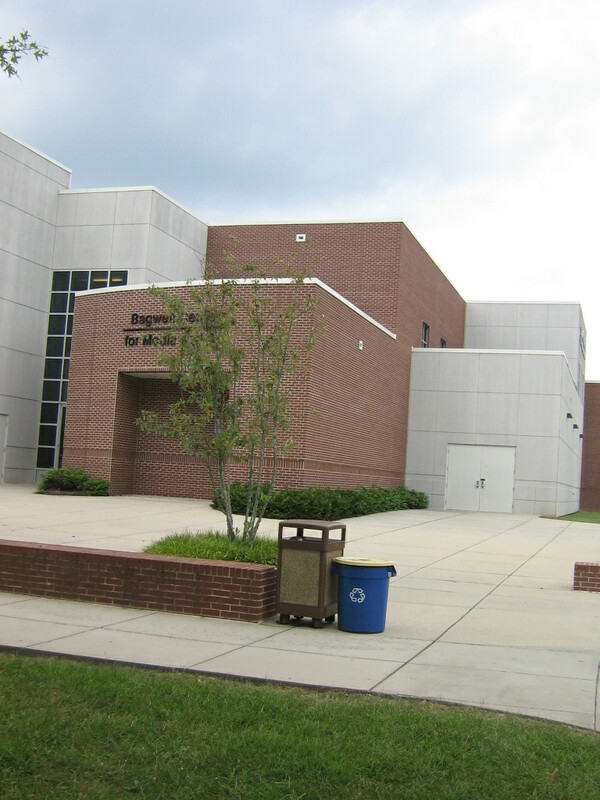 This is the Bagwell Center where Arts & Media classes go down. It is also one of the ONLY buildings that radiates some symbolism as to what happens within it’s confines. The outside design for the upper floors seems to be in blocks stacked on each other, creating one of the most unique building designs on campus. People can just look at it and tell that it is most likely the place where you will learn arts & crafts as well as computer design info. Over all: Pellissippi is VASTLY different in terms of hierarchy and unity compared with Maryville College. PSCC’s layout doesn’t make sense, except for the fact that the way it is spaced out makes everything convenient for travel between classes. Someone told me once that it appears to resemble a big prison complex, and surely the way it was designed wasn’t mean to give people that vibe. There is no real history given off by the place, thus making it’s background a hidden enigma. Nothing seems established and everything is very complex in trying to understand WHY it is the way that it is. This entry was posted in Maryville College Intro To Design "Stuff". Bookmark the permalink.